Before technology rising era, back in the 70’s the accounting and inventory tasks were made by hand on accounting books and worksheets, but suddenly in a blink of an eye mankind gave a step forward and the computer era arrived alongside with Lotus spreadsheet released in 1983 and finally one of the most useful app ever created, Microsoft Excel, launched in 1987, a totally unique and innovative spreadsheet, strengthened with new features and tools. As everything else, technology keep going forward evolving and adapting to a very demanding new age, nowadays, people is every time more interested in tools to simplify their daily life task, under this vertiginous life style, and due to this we created an outstanding app to offer a purposeful tool to the modern day executive. Using Opslab Web App you can upload SQL database and storage safely in the cloud protecting your data from viruses or computer failure, for your convenience and within easy reach integrated with the app and API you can built scalable spreadsheets, dashboards and reports and share or export them in a glimpse just with a few clicks. 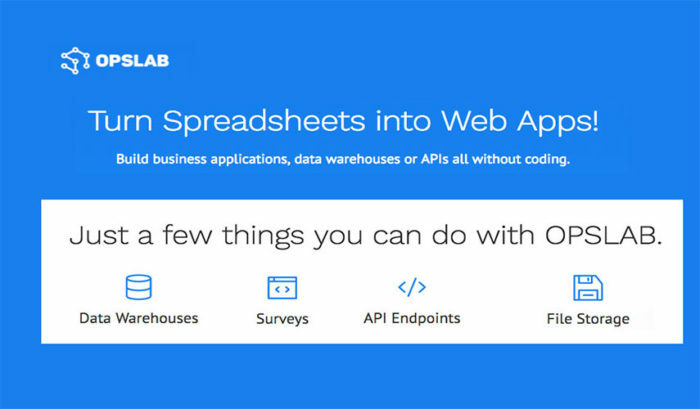 You can also create, design and share surveys, web forms and application taking the data from the main database, just using drag and drop feature, all data uploaded to the cloud using Opslab Web App can be instantly accessed by an unique URL or API endpoint. Once the database is uploaded in the cloud you can easily turn the spreadsheets into web app, no coding needed, simple and uncomplicated. Use it to improve your business and offer a better service to your clients, saving time and money. Using schema builder you can customize and add features and characteristics and define the web form of each of the tabs and tables inside your database to suit your needs and requirements, you can also turn on features like sorting, filters and typing access. This allows you to share, download or send to mobile as an app just the information you need and with the permissions to edit or not and keep the rest of the data stored in a different path for different purposes. – Full access to your information anytime everywhere just by introducing a URL asigned to each spreadsheet inside the database, allowing to sharing or downloading only the information required for a specific need. – Trustworthy storage, keeping data intact and safe from computer failure or disk crash. – Easy way to turn database into app, just in seven minutes, for a quick and convenient use as a mobile app making the access to important data simplifying task processes and allowing a fast access to important information at anytime. – Friendly easy to use interface. – Built reporting systems to help you analyze your business processes and optimize them, fast and easy. – Do not allow macro function after uploading spreadsheet to the Opslab Web App, which could be inconvenient for some database features and requirements.